Longtime play-by-play announcer for the Roadrunners, Al McCurdy, says that 38 games have been scheduled for live coverage this season. All of those games can be watched online live. Past games will be archived and will be available on-demand after April 1, per the coaches' wishes. McCurdy has been calling Roadrunners games since 1989. 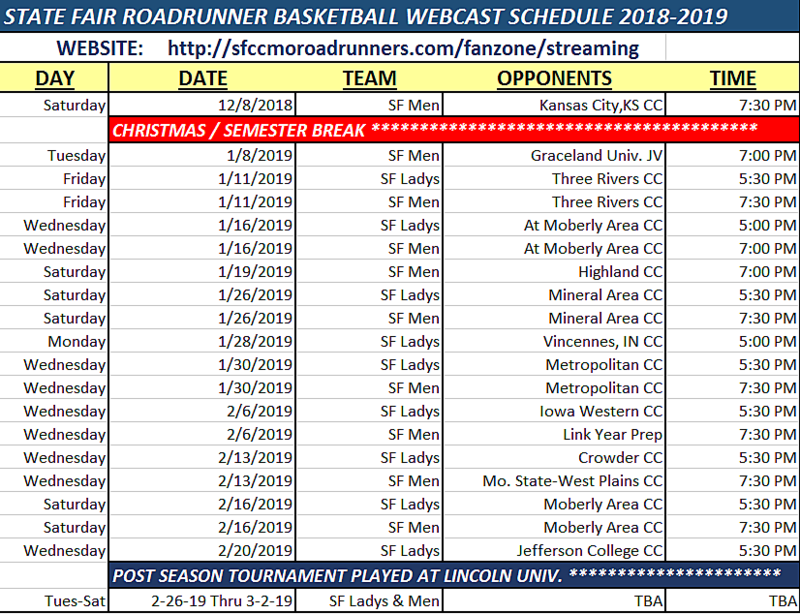 State Fair Community College Sports Information Director David Rohrbach is joining McCurdy on the webcasts as the color announcer. McCurdy says that both State Fair Community College basketball teams have struggled early in the season: "Both Men and Women’s teams have started out slow. The Lady Roadrunners are currently 4-6 on the season playing a very tough schedule with some key players out early in the season. The ladies have four returning players from last year, and are currently led in scoring by Sophomore, Jazzmyn Elston, averaging 17 points per game. The SF Men are currently 5-7 on the season with only three returning players from last year, and still working on team chemistry. The Roadrunners currently are led by Sophomore Caleb Coleman, averaging 16 points and 8 rebounds per game. The early part of the season is a great way to prepare for Region play which begins in January following the Christmas and Semester break. Both teams look very promising for the remainder of the season. Junior College sports of all kinds are exciting, and we’re lucky to have such a great tradition at State Fair."